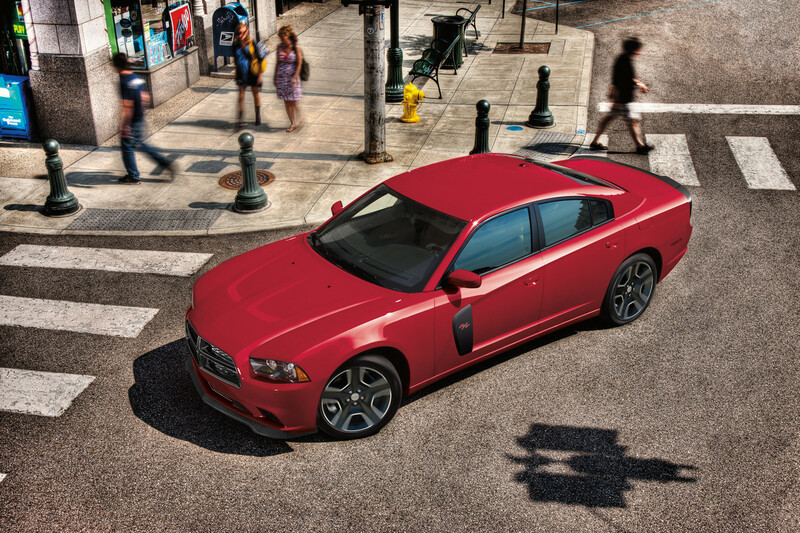 January 2, 2012, Auburn Hills, Mich. - Delivering performance and an even more aggressive look, the 2012 Dodge Charger Redline is a 426 HEMI-powered showcase of new Mopar performance kits that will arrive later this year. 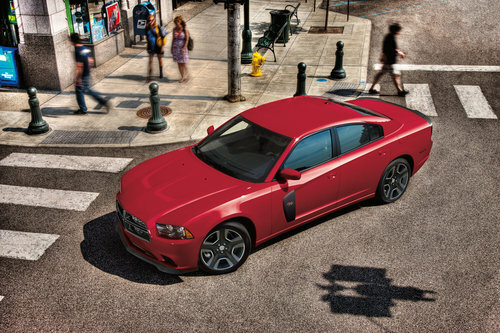 The Dodge Charger Redline vehicle with all three Mopar performance stage kits will debut at the 2012 North American International Auto Show. "Since the 1960s, the Mopar Brand has built a long history of adding power and performance to the Dodge Charger -- and with the Redline, we Moparized the new Charger with modern-day performance and style while giving a nod to our storied past," said Pietro Gorlier, President and CEO of Mopar, Chrysler Group LLC's service, parts and customer-care brand. "With three kits, Mopar offers a tailored choice for every customer." 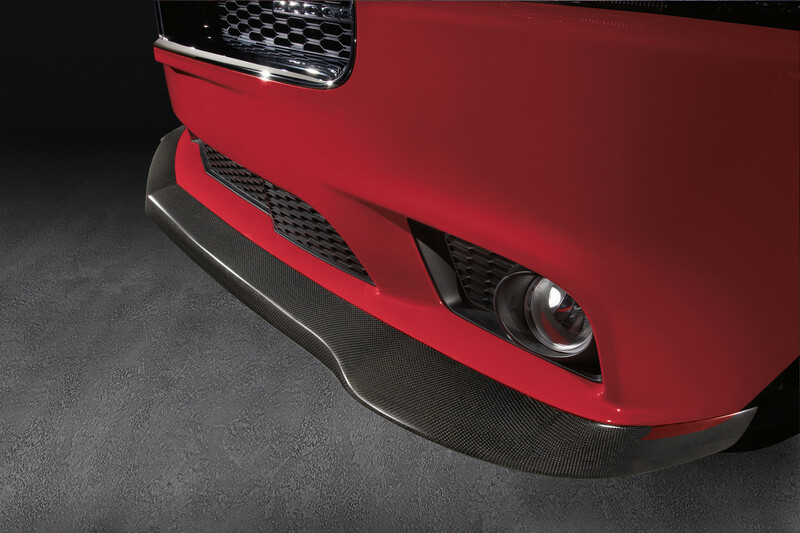 Based on the 2012 Dodge Charger R/T model, Mopar's list of Stage I modifications includes a full-width Mopar carbon fiber chin spoiler to give the Charger Redline a more aggressive appearance. Matching the Redline Tri-coat paint, the two-piece grille features a body-color painted-grille surround with black signature "crosshair" insert. Large 20 x 8-inch Mopar Black Envy Wheels feature a Pitch Black-painted wheel face with polished accents. Mopar carbon fiber door scoops highlight Dodge Charger Redline's signature body-side scallops and include heritage "R/T" badging to pay homage to the historic 1970 Charger model. 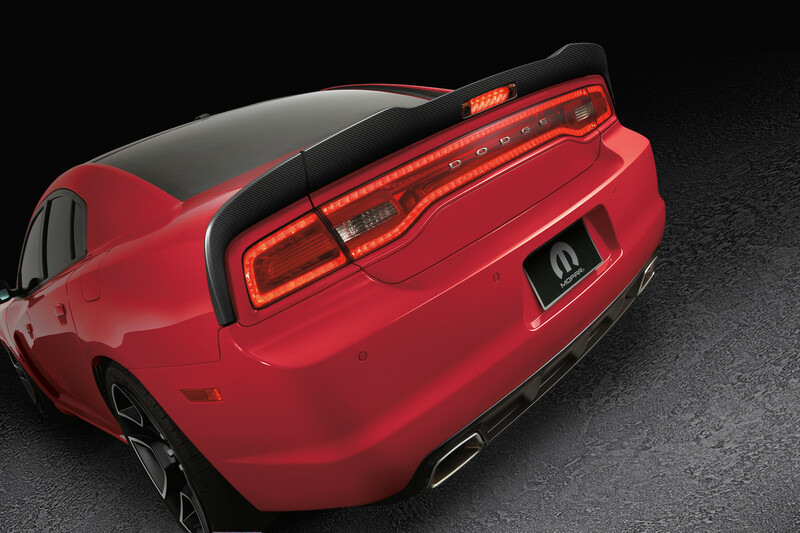 A three-piece Mopar carbon fiber rear spoiler adds additional down force and provides an even more dynamic look. Emphasizing Dodge Charger Redline's fastback silhouette is Mopar's vinyl roof graphic in matte black. The Dodge Charger Redline's cockpit design features premium materials and is further enhanced with a Mopar aluminum shift bezel and aluminum instrument panel bezel with Redline perimeter accent. For a more enthusiast-desired look, Mopar pedal covers are made from stainless steel and feature a rubberized pattern for improved traction. Designed and tested straight from the factory, the Dodge Charger Redline features Mopar's Stage II performance kit to enhance its already world-class power, handling and braking. Allowing the Dodge Charger Redline's legendary HEMI V-8 engine to perform at its optimal level, Mopar's cat-back performance exhaust system delivers an increase in horsepower and a menacing "throaty" sound. Under the hood, a front-tower cross-brace and front tower brace caps provide increased structural stability for improved handling dynamics. For ultimate braking capabilty, high-performance Mopar brake linings are track tested and deliver fade-resistance during hard braking use. Delivering 220 more horsepower than the 2012 Dodge Charger R/T, the Charger Redline features the new high-output version of the powerful and lightweight Gen III 426 HEMI V-8 crate engine (for race/off-road use only). With its legendary 426 cubic-inch "Elephant Motor," the Dodge Charger Redline delivers 590 horsepower via a lightweight aluminum V-8 engine block that shaves more than 100 lbs. from the traditional cast-iron crate version. The new Gen III High Output 426 HEMI engine is professionally built and includes a stout, balanced lower reciprocating assembly that features a forged-steel crankshaft with six-bolt mains at 2, 3 and 4, and cross-bolted 4-bolt mains at 1 and 5. H-beam style rods are made from forged steel and coupled to forged 11:1 compression ratio aluminum pistons. Included is a revised windage tray to provide excellent oil dispersion and prevents oil aeration by the crankshaft. The Gen III High Output 426 HEMI engine's valvetrain starts with a more aggressive roller camshaft with .639 intake and .628 exhaust lift and cylinder heads that feature the latest designs for exceptional flow characteristics. To help stabilize the valvetrain at high engine rpm, tie bars are available. Mopar cast-aluminum valve covers and billet fuel rails are also included in the Dodge Charger Redline's Stage III performance kit. For nearly 100 years, Dodge has defined passionate and innovative vehicles that stand apart in performance and in style. Building upon its rich heritage of muscle cars, racing technology and ingenious engineering, Dodge offers a full-line of cars, crossovers, minivans and SUVs built for top performance -- from power off the line and handling in the corners, to high-quality vehicles that deliver unmatched versatility and excellent fuel efficiency. Only Dodge offers such innovative functionality combined with class-leading performance, exceptional value and distinctive design. With the all-new 2013 Dodge Dart, the all-new Dodge Charger paired with the ZF eight-speed transmission that achieves a class-leading 31 miles per gallon on the highway, the new Durango and the significantly revamped Grand Caravan -- inventor of the minivan -- Journey, Avenger and iconic Challenger, Dodge now has one of the youngest dealer showrooms in the United States. Mopar is Chrysler Group LLC's service, parts and customer-care brand and distributes 280,000 parts and accessories. With the creation of the Chrysler Group and Fiat S.p.A. partnership, Mopar is extending its global reach, integrating service, parts and customer-care operations in order to enhance dealer and customer support worldwide. Combined with Fiat S.p.A., Mopar's global portfolio includes more than 500,000 parts and accessories which are distributed in more than 120 countries. Mopar is the source for all genuine parts and accessories for Chrysler Group and Fiat S.p.A. brands. Mopar parts are unique in that they are engineered with the same teams that create factory-authorized vehicle specifications for Chrysler Group and Fiat S.p.A.vehicles -- a direct connection that no other aftermarket parts company can provide. A complete list of Mopar accessories and performance parts is available at http://www.mopar.com. Mopar (a simple contraction of the words MOtor and PARts) was trademarked for a line of antifreeze products in 1937. The Mopar brand made its mark in the 1960s -- the muscle-car era. The Chrysler Corporation built race-ready Dodge and Plymouth "package cars" equipped with special high-performance parts. Mopar carried a line of "special parts" for super-stock drag racers and developed its racing parts division called Mopar Performance Parts to enhance speed and handling for both road and racing use.